As you can see from the list, one of the subtypes is pyrrole disorder or pyroluria. What is pyroluria? What symptoms does it create? What causes pyroluria? How do we determine if someone has it? And finally, how does one treat it? Pyroluria or pyrrole disorder is a sign of oxidative stress. Some clinicians suggest that there is a problem with hemoglobin synthesis and breakdown. A byproduct called kryptopyrrole is produced. This molecule shows up in the urine. Kryptopyrrole makes zinc and pyridoxine (vitamin B6) unavailable by binding them. With a decrease in zinc and vitamin B6 in the body, people can’t handle stress well and make poor choices. I believe that we all have access to an innate wisdom that allows us to connect with a higher source. Patient with Pyrrole disorder will lose access to this when levels get too high. Why Do People Get Pyroluria? What causes that is unknown. Some people believe it is a genetic condition. Others believe that stress and trauma cause pyroluria. There is some evidence that both chronic infection and/or environmental toxicity play a role in some cases. Of course, any and all may be true. Pyroluria is most likely a sign of oxidative stress. Oxidative stress is a condition characterized by too many undesirable reactions in the body. Oxidation refers to chemical reactions that transfer electrons. The body uses metals such as zinc, copper, iron, manganese and others to transfer these electrons. Heavy metals such as cadmium, lead, or mercury can disrupt these reactions. This may increase the oxidation in the body. This can create free radicals that start to disrupt normal biological processes. This increases inflammation. We need some oxidative reactions and some inflammation for many processes. Fighting off infections, wound healing, and controlling vascular tone are some examples. But too much can be a problem. It leads to vascular disease, insulin resistance, pain, insomnia, and many other problems. What are the signs of Pyrrole Disorder? 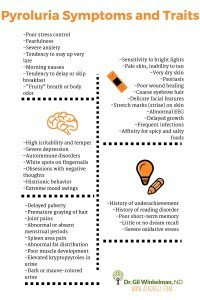 The signs of pyroluria are diverse. 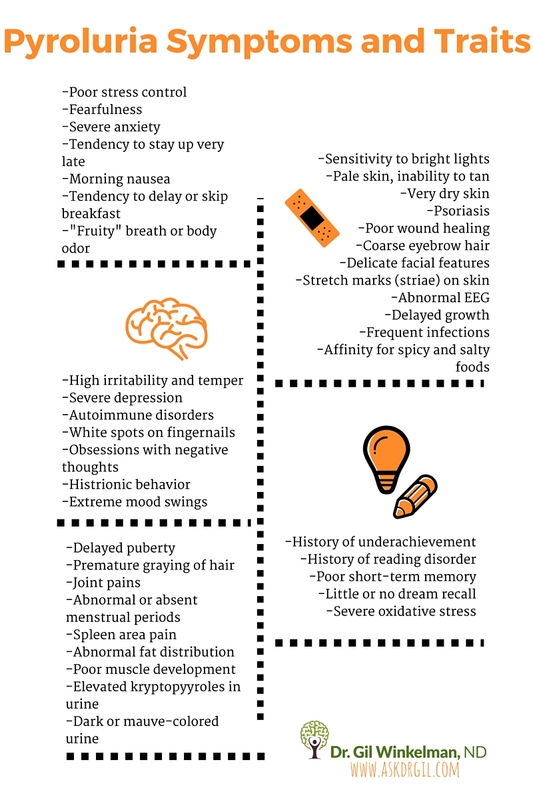 Below is a list of the symptoms that may appear in pyrrole disorder. The effects of pyrrole disorder can be mild, moderate or severe. Most patients only exhibit a handful of these symptoms. I’ve seen people who only had 1 or 2 of the symptoms and still had high pyrrole levels. In most cases, patients have at least two of the following: poor stress control, nervousness, anxiety, mood swings, severe inner tension, episodic anger (an explosive temper), poor short-term memory, and depression. In extreme cases of pyroluria there are severe mood swings and/or violent behavior. They may also have issues with wound healing, dream recall, and get frequent infections. Patients with elevated pyrroles have a corresponding drop in serotonin and GABA. This may account for the poor stress control. Some patients may not have any psychological symptoms but still test positive for urinary pyrroles. Given that pyroluria is a sign of oxidative stress, it may lead to other problems such as Alzheimer’s or Parkinson’s. How is Pyroluria Testing Performed? Pyroluria testing consists of measuring kryptopyrroles in urine. There are a few labs in the United States that do pyroluria testing. The lab I use is Direct Healthcare Associates (DHA). I have found them to be helpful over the years and they keep their prices down. (At the time of this writing it is $80 US for a test.) This test is complex. The sample must be frozen and then shipped. Interpretation of the results should be performed by a qualified clinician. I have seen many cases of false negatives due to other nutrient imbalances caused by pyrrole disorder. Having the appropriate knowledge is important for treatment too. Generally, the urine test is not done by itself but with an accompanying blood test. Pyroluria testing can confirm the diagnosis and may be useful to track treatment. For many patients, there is relief and a corresponding decrease in pyrrole levels with treatment. Other people get some relief but not complete relief. What to do? A second urine test can reveal if pyrrole levels are dropping. If they aren’t, the treatment may need altering. If the numbers are dropping but symptoms aren’t changing, there may be a separate issue that needs treating. It could be a different subtype which I will cover in a different article. Treatment for pyroluria is simple. Since the kryptopyrroles are grabbing zinc and pyroxidine, those need replacing. I give patients zinc and vitamin B6 or P5P, the active form of B6. This doesn’t reverse the condition but it does improve symptoms. I’ve observed patients improving after two to three weeks. In some cases, all symptoms disappear. Some of my patients though have other issues so we will treat that too. There are other supplements that I add depending upon the case. In general, omega-3 fatty acids are not recommended but omega-6s are. Vitamin C can also be useful to help reduce stress. Remember that if you follow this protocol, you need to have adequate oversight by a trained healthcare professional. High levels of zinc can interfere with copper levels in the body. Pyrrole disorder is likely more common than we have believed. I see patients with positive kryptopyrroles and/or very low zinc in my practice all the time. These people not only have difficulty with stress. They can’t access their innate wisdom easily. This causes them to make poor choices. Start making better choices in your life. Let me help you balance your physiology to allow for that to happen. Call today to schedule an appointment to decrease your health risks.